Custom Product Template is compatible with and has been tested on OpenCart versions 1.5.4, 1.5.4.1, 1.5.5, 1.5.5.1 and 1.5.6. This extension is a vQmod and as such requires you to have the vQmod system installed. The xml code requires vQmod version 2.3 or higher. You can download or learn more about vQmod by visiting code.google.com/p/vqmod/. First create your custom template. Easiest way to do this is to simply duplicate the existing file /catalog/view/theme/default/template/product/product.tpl. You can rename it whatever you'd like and then edit it to your satisfaction. Next, use one of the routes defined in System > Design > Layouts to point to your new template. You can use one that's already defined or create your own. For example, if you want to use a custom template for a product called "Example" which is located at /catalog/view/theme/default/template/custom/example.tpl, you can create a layout called "example" with the route "custom/example". You don't need to include the "tpl" extension or theme path as these will be automatically accounted for. You can now set this template to the a product by going to Catalog > Products > Example in the admin panel and clicking on the Design tab. 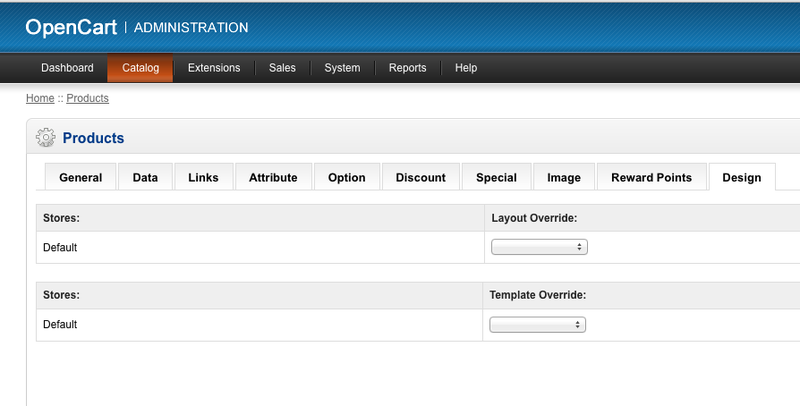 There you should see a new field called "Template Override". Simply select the layout route you created previously and you're good to go. If by chance, you select a layout with an invalid path OpenCart will simply revert back to the default product.tpl as a fail-safe.